A1 York Corner Summerhouse 7 x 7 / 8 x8 / 10 x 10: The A1 York Corner Summerhouse is a traditional looking corner summerhouse with a hipped roof and small canopy over the double doors The building is easy to assemble with ready-made panels and has superior attention to detail in the finishing touches. This summer house has two glazing options; you can choose from Georgian style glazing or square leaded glazing to suit your personal taste. The two side windows are outward opening and also feature window boxes. The timber of the building has been dip treated and will protect your building for the first few until you wish to apply a timber treatment of your own choice. 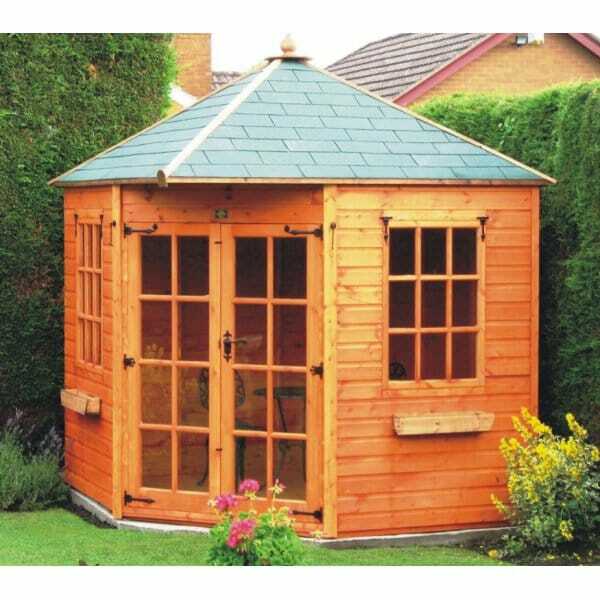 A fine example of a top quality Summerhouse from Garden Chic.